The argument that Arsenal are reliant on Robin van Persie would prove most conclusive when the Dutchman isn’t scoring goals, as opposed to when he is. 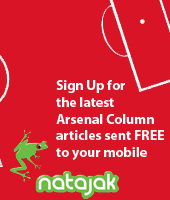 So, in the first league match in seven games in which he has failed to score, are Arsenal reliant on Robin van Persie? That answer is probably yes although the overriding reason for Arsenal’s mute performance on Saturday seemed to be down to fatigue as well as Fulham’s obdurate defending. Arsène Wenger admitted his team lacked accuracy in their passing and that proved crucial given Fulham defended as they did. Essentially though, Arsenal were too functional and the selection was in need of a little invention. Yossi Benayoun’s impressive cameos deserved a bigger stage while Abou Diaby was deemed not match fit to start – both players will surely take their starting births against Manchester City in midweek. As a result, Wenger pushed Aaron Ramsey up the pitch from the outset before the inevitable fatigue factor came into affect and he had a couple of chances himself to give Arsenal the lead. Robin van Persie had a shot cleared off the line but he was forced to take more of a creative role because Arsenal’s passing lacked urgency. The fact that Theo Walcott has laid on so much of his goals highlights just how Arsenal have changed; where it was once about quick passing around the box, they now procrastinate that movement before feeding the ball to the wide men to deliver. Thankfully, Walcott’s movement was good and given the opportunity to test John-Arne Riise, he impressed. The Gunners though failed to break down Fulham’s defence and the 4-4-2 in the second-half suited the urgency of the situation. Fulham, on the other hand, have carved out a niche in recent years of being organised and tough to break down and despite the flurry at the end, were well worth the point. They would have preferred to play a more functional Arsenal and it showed; in the moments where passed with urgency they looked very good. Unfortunately, Vermaelen’s goal and the sustained pressure soon after came much too late to force the win although they mustn’t be too unhappy at the result. A key feature of Arsenal’s second-halves – when they are searching for the win – has been to push Aaron Ramsey up the pitch and aiming to profit from his drive. But Wenger initiated that straight away against Fulham, indicating he had always had reservations about Aaron Ramsey’s fitness levels. The Welshman picked the ball higher up the pitch than normal but what was most notable was that he also pressed higher making Arsenal’s formation look more like a slanted 4-4-2 off the ball. But of course, Arsenal do not press intensely therefore the closing down was more about positioning and he did well to help create a barrier to stop the easy pass from midfield. As a result, Fulham had a lot of the ball just inside their half. Fulham matched Arsenal in possession in the first-half before The Gunners gradually grew more dominant. The relaxed pressing this season meant Fulham could have a lot of the ball in front of the defence with Danny Murphy and Dickson Etuhu happy to oblige. Ramsey ensured he got on to the end of moves as well as starting them. His drive set the tone for the early exchange. The absence of Bacary Sagna hasn’t been made as obvious as it might have from a defensive viewpoint as Laurent Koscielny and on Saturday, Johan Djourou, have filled in with admirably. But it was from an attacking viewpoint as Arsenal hardly passed the ball our from deep on the right side. Fulham targeted Arsenal’s right-hand side particularly in the absence of Sagna. As a result, Djourou was denied possession from deep and Arsenal’s play was slanted to the left. However, that’s not to say Djourou is poor on the ball. Rather, Fulham targeted him in the build up and the movement of Clint Dempsey constantly dragged him in the centre. What Martin Jol did well was to keep Dempsey up the pitch – almost as a left-ish striker thus denying Djourou from getting forward. His deployment was the reverse of a defensive winger; whereas someone like Dirk Kuyt (a defensive winger) would try and stop the attacking full-back influencing by tracking him all the way back, Dempsey stayed up the pitch to give Djourou second doubts about getting forward. Djourou couldn’t and he was under pressure each time he got forward. In the second-half, Fulham dropped back into their own half and the Swiss was more freely able to get forward. However, while his passing was surprisingly safe, he was unable to provide the overlap Sagna so typically provides. (Part of that may go down to the switch to the 4-4-2 thus making Arsenal more direct). Johan Djourou’s passes in either half. The upshot of Fulham targeting Johan Djourou was that he was unable to support Theo Walcott and get on the overlap. As a result, Walcott was forced to play a more orthodox role and he performed that very dangerously. His cross led to Arsenal’s equaliser and along with the powerful runs of Andre Santos on the other side, he stood as Arsenal’s best chance of creating another goal. Theo Walcott received most of his passes on the touchline as John-Arne Riise gave him little space behind while the blocking of Djourou overlapping meant a lot of his early passes were backwards. Per Mertesacker’s Arsenal career has been solid if not spectacular and being a novice, he might have expected to be given a more sterner test in Europe’s best league™. But so far, he’s been given an easy ride with Bobby Zamora choosing to play on Thomas Vermalen’s side instead. The battle between the two was intriguing and Zamora looked to have the last laugh when Vermaelen put through his own net. But the Belgian was determined to put that right and he came up with the winner after a run which went unmarked. (Surely, Zamora wasn’t expected to track him, was he?!) Fulham’s play generally slanted down Arsenal’s left, however, so perhaps that’s the reason why Zamora was mostly up against Vermaelen. But Mertesacker should expect busier afternoons than this. Bobby Zamora picked the ball up mainly on the left. “Good ball retention starts from the keeper” writes Zonal Marking but job is made easier if the opponent let’s you. Fulham were more than happy to let Szczesny play it short and he did, attempting only one long pass. Which, inevitably, was unsuccessful. When Robin van Persie first assumed the no.9 position, he was thought to be unsuited to the role because he liked to dropped deep to pick up the ball. In the early parts of that tactical reshuffle, Arsenal profited from van Persie getting into space and playing his team-mates in. He did that again against Fulham, particularly in the first-half and he was unlucky his pass to Andrey Arshavin was ruled out for offside. He played a bit deeper, usually looking to give moves some impetus as Arsenal’s passing was, at times, too slow while Fulham defended deep to deny him any room behind. Mentally, Arsenal never looked fully focused in breaking down such a stubborn defence and the switch to 4-4-2 at the end was necessary. He still roamed around the pitch and Arsenal looked more urgent in the final ten minutes, van Persie still reminding everyone that he can perform a creative role if needed. Van Persie got onto the end of two crosses in his last game against Dortmund and generally ran the channels well. Against Fulham, with Arsenal playing with two players hugging the touchline, he tended to remain central. Arsenal: Szczesny (6), Djourou (6), Mertesacker (6), Vermaelen (7), Andre Santos (7), Song (6), Ramsey (6), Arteta (6), Walcott (6), van Persie (6), Arshavin (5). Subs: Fabianski, Diaby (6), Koscielny, Frimpong, Gervinho(4), Chamakh (4), Benayoun. Fulham: Schwarzer (5), Baird (6), Hangeland (6), Senderos (6), Riise (6), Etuhu (7), Murphy (7), Dempsey (5), Ruiz (6), Dembele (6), Zamora (6). Subs not used: Etheridge, Johnson (4), Kasami (4), Gecov, Hughes, Frei, Briggs. Ratings breakdown: 1-3: Absolute stinker, 4: below par; ineffective. 5: par, average. 6: Above average; solid if unspectacular. 7: Impressive; good performance. 8-10: Substantial impact, match winning. NB: Our thoughts go to Gary Speed and his family. Speed impressed me very much as a player and also a human being. I remember thinking, with a bit of luck, he could have achieved more in the early/mid nineties and not just his superb league title triumph with Leeds United. It was a dream for him to become Welsh manager, something you work your whole life for and for some reason – and I think his privacy deserves to respected at this moment – it was gone in an instant. May Gary Speed rest in peace.